Oh, I feel old all right. My body feels old. Usually on foggy mornings after a night-time zumba class, I awake with my bones rattling about like dice in a cup. I stretch. I groan. I buy Aleve in the big bottle with the arthritis lid. My attitude, though, feels pretty young to me. I feel like I can hang with the kids and be okay. I’m a COOL old person, damn it. At least that’s what I tell myself. 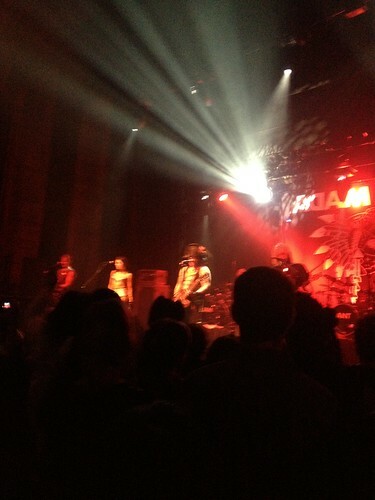 My friends and I went to see Adam Ant at our local concert theater. It’s a funky venue, an old movie palace, and despite its sucky sound system, it’s a decent place for a show. The last time I had seen Adam Ant was when he was still Adam and the Ants, in 1981 at the Greek Theatre in Los Angeles. I figured it was time to catch up with him after 30 years. Adam was still wearing the same damned pirate hat, which made me a little sad. After three decades, I figured he might be able to put it away, but nope, there it was, looking like a bad pirate costume from the Halloween rental, a little bashed and battered. The truly odd part is that he had transmogrified from the Adam Ant MTV version of a pirate into the Jack Sparrow/Johnny Depp version, complete with Johnny Depp glasses. Oof. It made my heart squinch up a little to see. I asked CC later, “I dunno what I expected – an acoustic set on a tall wooden stool or something?” I’m glad it wasn’t, because Adam Ant Unplugged might have sent me fleeing into the street. I was standing in the pit close to the stage when things got weird for me. People were using their phones, which I’m used to, sure, to shoot photos and video. But the girls in front of me – they were maybe 25 – were on Facebook the whole time. The whole entire concert. They shot photos. They edited them. They tagged them. They commented on their friend’s photos. They uploaded video. It was like they were at a show, but they weren’t at a show. They didn’t care about Adam Ant as the presenter. To them, it was THEIR show. They were the stars in their own media event. Adam Ant didn’t matter so much except as a backdrop to THEM. This is a sea change from how my friends and I went to concerts when we were that age. We were thrilled to be in the presence of an artist we cared about. We were fans and we wanted the band to know we were there for them. Don’t get me wrong. We wanted to prove to our friends that we were there, of course – thus the rise of the spectacularly overpriced concert tee. There’s a kind of subtle difference, I think, between “You had to be there” and “Look at how much fun I had there.” We wanted to be soaked in the experience. I wonder, if we had had cell phones or were allowed cameras, would be have been as obsessive about using them? I only shot one photo last night. A blurry one, but I did it. Just to show those young whippersnappers that I could. In a similar vein, I’ve noticed that the kids these days don’t have that burning desire to get a driver’s license and a car. When I was 16 I Could Not Wait to start driving. I wondered about this for a while, but I think it’s because of the internet. Kids don’t really need to go anywhere anymore. Why go to the mall when you can shop online? Why go hang out when you can text, facebook, Skype? And obviously there’s no need to go to the library anymore. Awww…the kids these days! Hey….can you pass me some Aleve?! Oh…I shouldn’t have read this. Now I’ll have nightmares of an aging Adam Ant. I kind of like that he has let himself get a little middle-aged looking.